Inflatable Airblown Santa on Airplane. Tell a fun holiday story in your yard with this airblown inflatable Santa Claus. 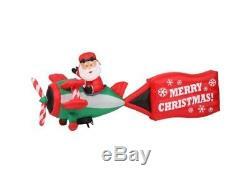 Santa sits at the controls of a green and white plane with red and candy cane accents. A cheerful penguin rides along as passenger, and the plane tows a large red banner that wishes everyone who sees it a Merry Christmas! This Christmas scene inflates automatically. Plug it in, stake it down and watch the magic of this airblown inflatable unfold. Lights up with energy efficient LEDs. Includes everything needed for outdoor setup. Packaged dimensions: 15.75 in. H x 13.78 in. W x 13.78 in. Inflated dimensions: 70.87 in. H x 192.13 in. W x 83.07 in. Power cord: 5.25 ft. Constructed of iron, polyester and plastic. The item "Home Accents Holiday 16 ft. Inflatable Airblown Santa on Airplane" is in sale since Friday, December 22, 2017. This item is in the category "Home & Garden\Holiday & Seasonal Décor\Christmas & Winter\Yard Décor". The seller is "rjdajd" and is located in Kittanning, Pennsylvania. This item can be shipped worldwide.